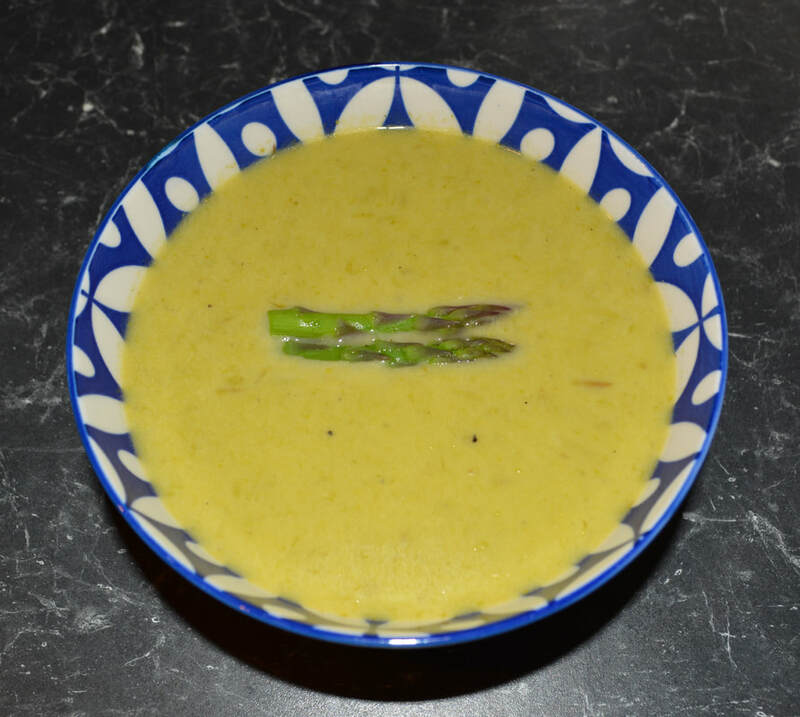 I had some asparagus in the refrigerator and my husband asked if I would try to make cream of asparagus soup. I have never made it, so I went about looking for a recipe. I found a recipe I thought would be good, but I didn't have enough asparagus, but I made it anyway, it was delicious. Took me by surprise how something so simple could taste so great. With 2 bunches, it was slightly runnier than I would have wanted, but the flavour was amazing. The following day I was at my local green grocer and saw asparagus was on sale if you buy 3 bunches, so I did. Then I went and made the soup with 3 bunches. Delicious again, flavour amazing. But I still felt I wanted to try it with a fourth bunch. So the next day I bought 4 bunches of asparagus soup, made it and absolutely loved it. It was thick and luscious, absolutely divine. 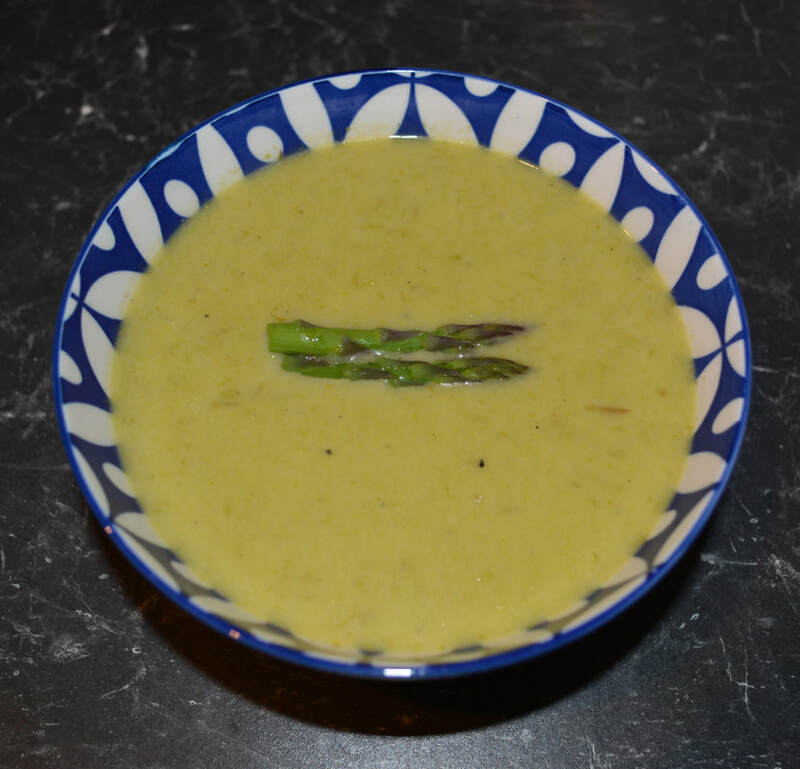 I found whether using 2,3 or 4 bunches of asparagus the flavour is amazing, the soup just gets a bit thicker with the more you add. This is so simple, yet so good. My family has stated this is one of their absolute favourite soups. It really is that good. Cut the tips from 12 asparagus, about 2-3cm long. Halve the tips lengthwise if they are thick. Reserve for garnish. (Now this part is optional, if I am making this for my family I wouldn't bother, as they don't care for garnishes, but for guests I would make the effort). Cut 1-2cm off the ends of the asparagus and discard as it can be tough and woody. Now cut all the remaining asparagus stalks into 1-1.5cm pieces. Heat a medium sized saucepan over a low to medium heat, add butter and onion, sauté, stirring regularly, for 4 minutes, or until the onion softens (Reduce the heat if the butter and onions look like they are colouring too quickly). Add the asparagus pieces, sauté, stirring regularly, for 5 minutes. Season with a little salt and white pepper. Add the chicken stock, bring to the boil, simmer for 20 minutes, or until the asparagus is very tender. While the soup is cooking, bring a small pot of salted water to the boil, cook the reserved asparagus tips for 3-5 minutes, until just tender, then drain. Now if you want the soup to be perfect, puree the soup in batches in a blender until smooth, place pureed soup in a bowl, then return to the pan once all is blitzed. I prefer to just use a stick blender straight in the pot, blitz until smooth (I always miss a piece of asparagus, but my family love that). Either way be careful with hot liquids. The soup should still be really hot, if not, bring back to a boil. Turn off the heat, add the cream, and stir through to combine. Season with salt and pepper, if needed. Serve immediately and garnish with asparagus tips.